In Ocean's 8, Daphne Kluger (Anne Hathaway) is a movie star and fashion icon with enough ego to last multiple lifetimes and a crippling need to be loved and adored by all. This makes her the perfect mark for the newly paroled Debbie Ocean — and also a perfect way for Hathaway to respond to her haters. Throughout the heist movie, Daphne has several moments that act as a direct responses to her real-life portrayer's critics, who've spent years ridiculing her for being "too perfect" or "trying too hard." 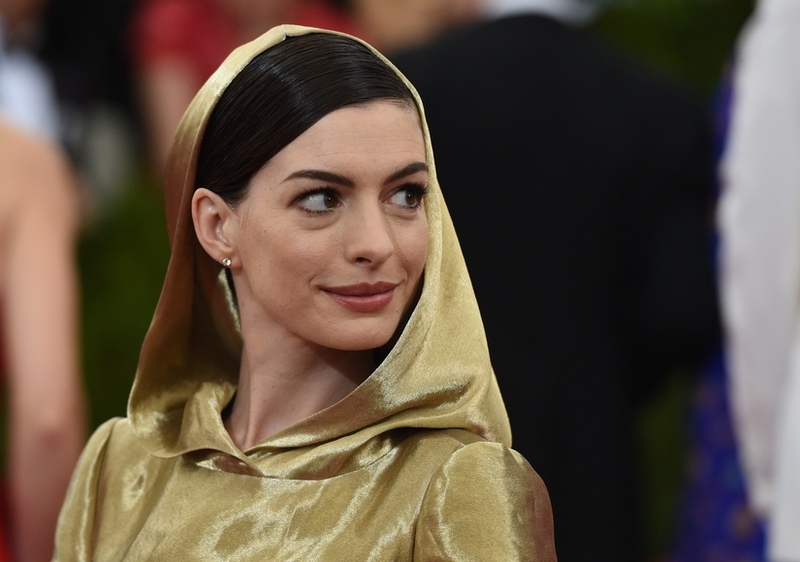 With Ocean's 8, Hathaway takes the "Hathahate" and makes it work for her instead of against her and in doing so, she delivers comedy gold that proves she's the one having the last laugh. All during Ocean's 8, Hathaway plays up the ugly sides of Daphne, whether it's when the fictional celeb is walking the carpet at the Met Gala, having a breakdown during a dress fitting, or playing dumb for an investigator. Daphne can go from berating her staff to putting on the charm for a designer in the span of seconds, and it's the same kind of two-faced approach to stardom and acting that Hathaway has often been accused of herself. It's hard to look at this performance and think that Hathaway wasn't having fun with the idea of finally bringing the the Hathahate image of her to life. Even the way Daphne chews gum and smiles — with every action, every flick of the wrist or turn of the mouth exaggerated — feels like a calculated act of self-aggrandizement. As Ocean's 8 director Gary Ross put it to Glamour, "Anne is pretty darn self-aware," and Hathaway herself clearly intended to address her public persona with the role. "I feel like Daphne is my shadow self," the actor said in an interview with Entertainment Weekly. "She's enjoying it [fame] and it brings her a great sense of self-worth and identity and she believes that's who she always truly was." In other words: Daphne is an extreme version of what critics think Hathaway is, as well as a reminder of just how overblown that pushback has been throughout the years. Lest you forget, the criticism against Hathaway began around 2012, when she starred in two of the year's biggest movies, The Dark Knight Rises and Les Misérables. As the actor campaigned for a Best Supporting Oscar for Les Mis, she became almost inescapable, and that's when the Hathahate took off. Critics felt she was too desperate to win the Oscar, too enthusiastic, or that she tried too hard to come off relatable. As critic Richard Lawson wrote for Hollywood.com at the time, "She always seems like she's performing, and her favorite act is this overstated humility and graciousness... she is the epitome of the bad kind of theater kid." Years later, the hatred has mostly calmed down, but the idea that Hathaway is "fake" has unfortunately stayed in many people's minds. So it's truly perfect that the actor uses her Ocean's 8 role as a rebuttal to her critics. In one particularly funny moment, Helena Bonham Carter's character sees a photo of Daphne on the red carpet that's actually a real photo of Hathaway and says something quick and critical along the lines of, "She seems tense." It's the kind of criticism that Hathahaters make all the time for the star, knocking her even the smallest apparent effort to look natural and poised. Though Hathaway has not directly mentioned the backlash while doing press for Ocean's 8, she has hinted at it. In an Entertainment Weekly interview, she discussed a scene in which Daphne has a panic attack during a fitting and has to be reassured that she has the best neck in the world, a hilarious moment of vanity akin to what some viewers might falsely think the actor herself experiences. "The level of ego-stroking and ego-inflating that can occur is so ridiculous. It was so much fun to poke fun at that," Hathaway said. Hathaway spending much of Ocean's 8 making fun of her public image is indeed great, but what's even better is how the changes Daphne goes through over the course of the movie reflect Hathaway's own transformation. The initial characterization of Daphne is that she's a stereotypically spoiled, self-absorbed Hollywood star, but by the end of the film, she's given real nuance. Just as one might mistake Hathaway for "the bad kind of theater kid," one might mistake Daphne as another dumb, self-obsessed actor. And just as Hathaway continues to prove her critics wrong by showing off self-awareness, Daphne too gets the chance to show her true self in Ocean's 8. It's time for all of us to officially retire the Hathahate narrative, and through Daphne Kruger, Hathaway herself is expertly showing us how it's done.